With the car industry recovering from the worst of the economic recession new models are now regularly appearing and there looks to be no shortage of new 2012 convertible cars. Below are some of the best convertible cars we expect to see hitting our roads during 2012. The Peugeot 208 hatchback has already been launched and a hardtop convertible will be produced as with previous generations. The design of the Peugeot 208 CC will be focused on slick style and cruising luxury with seating for two adults and two little ones. Sportiness will be saved for a two-seater Peugeot 208 Roadster version. The 208 Roadster will go up against the new Mini Roadtser (below) with which it will share an 1.6 litre turbo engine. The Peugeot 208 Roadster is likely to have a canvas roof and stripped down interior. The new Beetle arrived in 2011 in coupe form only but a convertible is to follow with the new style in 2012. It is redesigned from the ground up and while more sporty it is unmistakably a Beetle. Unlike the previous Convertible Beetle however it will be more aggressive and less feminine to appeal to a wider audience. The soft-top will remain to keep the costs down and lets face it there just isn’t space for a hardtop. We expect the soft-top to be folded away rather more neatly than on the previous model. The chassis will be considerably stiffer giving better road handling while greater length and width than the 1998 model and should give more interior space. Don’t expect a flower vase on the dashboard of this new more macho Beetle. The new VW Beetle Convertible is expected to launch in the US in time for the 2012 summer but may not reach other parts of the world until 2013. It was inevitable with the reintroduction of the Convertible VW Golf that a GTi version would be soon to follow. The trim and powerplant should correlate with those in the hardtop GTi (2.0-litre turbocharged four-cylinder) while prices will be a little higher. It should go on sale by late summertime. Aston have already squeezed the monstrous V12 into the Vantage Coupe. Now it’s the Roadster’s turn. The bigger engine also seen (in various forms) in the DB9 Volante and DBS Volante. It sounds wonderful and if the coupe is anything to go by will be great to drive too. The Aston Martin V12 Vantage Roadster is due to be unveiled at the Geneva Motor Show in March. Aston Martin also have a new flagship car under development along the lines of a baby One-77. Production will start with a coupe but a convertible version is likely to follow. An all new 2013 Mercedes SL Roadster is in the final stages of testing and will be released onto the market in 2012. The new Mercedes SL will be stronger and considerably lighter then the current heavyweight, it will also have more elegant lines than the 2008 revised car which it replaces. The folding hardtop will remain and will be even neater than ever before. The styling looks to resemble the latest SLK Roadster with a big SLS inspired grill. Although every new Porsche has the same familiar family look the 2012 Boxster will see considerable changes. A new generation turbo charged flat four engine is to be used which should be both lighter and more powerful than the current flat 6. It should also offer much better fuel economy and lower emissions than ever before. Spy photos of the car under testing show a design that reflects the Porsche Carrera GT much larger air intakes to cool the big turbo chargers. UPDATE: An updated flat 6 cylinder engine was used to power both 2013 Boxster and Boxster S models. The Porsche 918 supercar was confirmed for limited production some time ago and we hoped to see it released in 2011. The sophisticated car obviously requires further development time however so perhaps 2012 will be its year. Power comes from the 3.4 litre V8 engine from the RS Spyder Le Mans Prototype racing car, supplemented by three electric motors delivering an additional 218 horsepower. 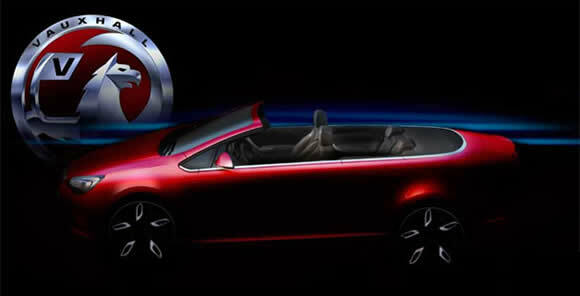 GM’s European brands will get an all new four seat convertible in 2012 as part of an ongoing attempt to change perceptions of the brand. The new car will likely to be based on the same platform as the Astra but be significantly different enough to earn its own name. This will also help to extend the car’s lifespan should the Astra hatchback be updated. After their recent hardtop convertible designs Vauxhall/Opel will be making a return to fabric for the roof material. This will help to keep costs and weight down, improve luggage space and keep the styling attractive. The Astra GTC launched in 2011 could give some clues to the styling. 2012 could potentially also bring a replacement for the discontinued Tigra small convertible. Following on from the Camaro ZL1 Coupe unveiled in 2011 Chevrolet will bring a truck-load of muscle to the drop-top Camaro. Powered by the 580 hp 6.2 litre LSA engine and with a chassis developed to take the grunt it should deliver exceptional performance on road or track and at a price that is well below that usually associated with such figures. A convertible version of the Citroen DS3 supermini is on the way. Few details have been confirmed but it is likely to have a fabric roof (possibly in the Fiat 500 rollback style) and seating for four (or at least two adults and two kids). Expect the Citroen DS3 cabriolet to be funky and forward thinking rather than its retro style competitors – the Mini Convertible and Fiat 500C. The French brand are also said to be working on a radical new Citroen 3CV based on the lines of the classic utilitarian 2CV. The simple, back-to-basics design that is cheap to buy and own may use a low carbon power source. So far we can only guess if it will follow its predecessor and have a convertible roof. 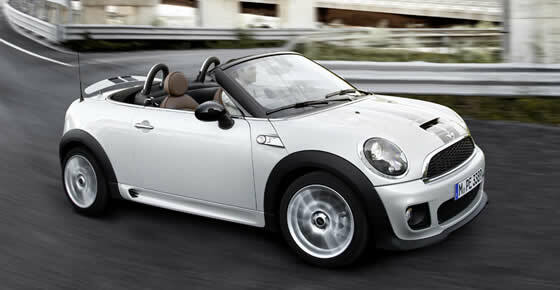 Already announced, the Mini Roadster is a sporty two seater version of the standard car. The suspension is firmed up and lowered and the new design has a lower centre of gravity. It should result in a fun to drive car that can give the Mazda MX5 Miata a run for its money. The Roadster has a manually operated fabric roof to keep both weight and costs down. The top folds neatly away and leaves plenty of luggage space. 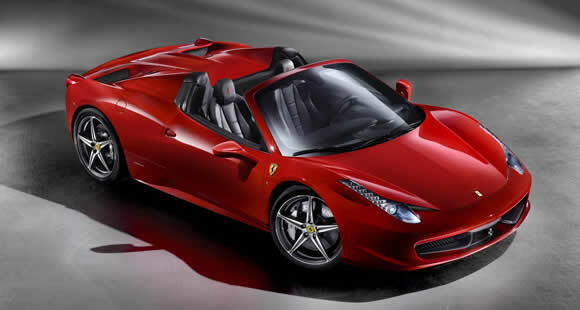 The Ferrari 458 coupe took the supercar world by storm combining massive power with precision handling. The Ferrari 458 Spider takes this a step further by adding a clever folding hardtop that neither adds weight or spoils the lines of the car. If anything the Spider is more attractive than the coupe, even with the roof up. With the roof down it is quite spectacular and the lucky occupants get to hear the tuneful V8 engine in all its glory. Lamborghini’s top level car will loose its top for the first time in 2012 so we can really get to hear the V12 sing. The Aventador Roadster is likely to make its debut at the Geneva Motor Show in March. Expect a better roof design than the flimsy pop-up roof from the Lamborghini Murcielago Roadster. Cars spotted doing final testing appear to have hardtop panels with the rear of the car much the same as the coupe. Potentially this could get a power-folding hardtop but could just as likely be a panel that is removed by hand. With the new BMW 6-Series Convertible released in 2011 we fully expect the Motorsport ‘M’ tuned version to be on its way soon. A heavily disguised version was seen undergoing testing some time ago so we should see the 2012 BMW M6 Convertible released in time for the summer after being unveiled at the Detroit Auto Show. Expect it to be powered by the same twin-turbo 4.4-litre V8 seen in the latest M5 saloon but tuned to produce up to 600 bhp. The M6 Convertible’s roof will be the same twin buttressed fabric type seen on the 6-Series Convertible. With the 5 door BMW 1-Series arriving in 2011 the rest of the range needs to catch up to with the new platform. There haven’t been many rumours floating around yet but unlike the 3-Series we shouldn’t have to wait until 2013 for this one. Like the 1-Series the BMW 3-Series saloon also received a refresh in 2011 while the other variants continue with the previous shape. The BMW 3-Series Convertible is due to catch up soon and this industry leading car may just appear in time for the summer of 2012. Although this car will be based on the 3 Series platform it may actually be branded as a BMW 4-Series Convertible. © Copyright 2011 Convertible Car Magazine. 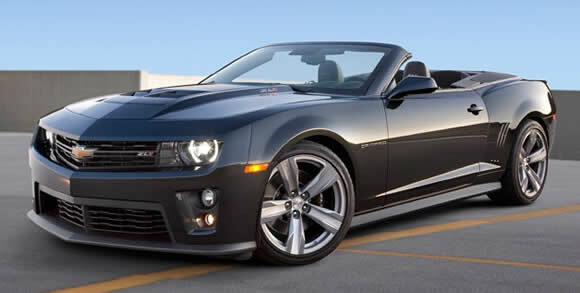 Convertible Car Article - New Convertible Cars for 2012.